“For those familiar with my art practice, and with my sense of humour, this situation is oddly suited to me and I am sure will inform my work for years to come”. The words of Rebecca Moss, a 25-year-old ‘absurdist artist’, who is currently in the absurd situation of being stranded off the coast of Japan on the 68,000 tonne container ship the ‘Hanjin Geneva’ www.theguardian.com/artanddesign/2016/sep/14/artist-stranded-container-ship-rebecca-moss-hanjin. An MA student at the Royal College of Art in London, Rebecca was taking part in a residency programme organised by a Vancouver art gallery called ‘23 Days at Sea’. Her aim was to explore ‘the comedic potential of the clash between mechanical systems and nature’ but she got more than she bargained for when the Hanjin Shipping Co, the world’s seventh-largest container shipper, filed for bankruptcy after her trip going westward from North America to Asia had commenced. 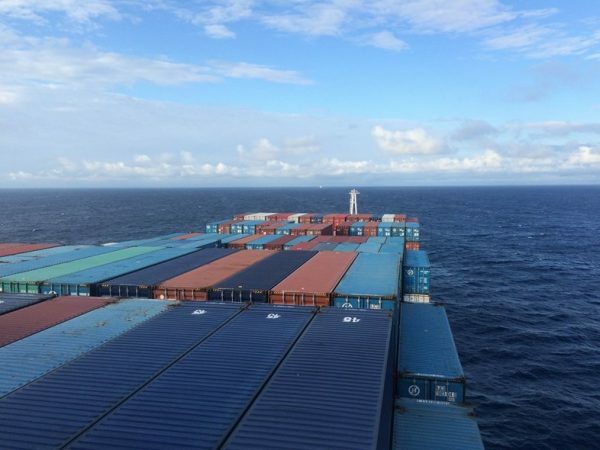 Rebecca’s ‘23 Days at Sea’ should have been up by now but with no means to pay docking or cargo handling fees Hanjin’s ships are being refused entry into ports and are at sea with no destination. “The situation is completely ironic” she said “It is bizarre how much it suits my interests.” I hope Rebecca’s adventure gives her lots of material and wish her a safe return to dry land. I was interested in the story firstly as it plays into the notion of ‘peak stuff’ – the state where our appetite for extraneous ‘stuff’ is saturated and we are using fewer material resources. We are starting to ask what is this stuff for? Does it make us any happier? Does it do us more harm than good both as people and as a planet in view of ongoing resource depletion (worth a blog of its own)? As Rebecca puts it “It has forcefully underscored the contradictions I always perceived about this endless stream of stuff that is constantly flowing across the Pacific”. In the case of the ‘Hanjin Geneva’ what stuff is actually in the containers? Why is it necessary to transport so much of it across the Pacific? To what extent has its non-arrival been noticed? I was interested in the story secondly as it illustrates the fragility of the systems that we rely upon to underpin our daily life. Hanjin Shipping Co apparently accounted for 8% of the trans-Pacific trade volume for the US market yet its activities ceased at a stroke. It’s like the stories we regularly hear of how fast the supermarket shelves will empty in this or that crisis. The answer, as many are beginning to realise, is to build a more robust and sustainable way of life based on local goods and services – and there’s nothing absurd about that. What right does an architect have to expect that their buildings will not be demolished during their own lifetime? This question occurred to me when I learned of the death of Isi Metzstein who was my final year tutor at the Mackintosh School of Architecture during 1979-80. Isi was a partner in Gillespie Kidd and Coia – one of the greatest British post war architectural practices as well as an inspirational teacher. He will be remembered for his buildings, teaching and discourse. I knew that some of Isi’s buildings have already been lost but I was unaware of the fact that he was responsible for the formation of ‘The Rubble Club’ www.therubbleclub.com – an organisation open to architects who have had buildings destroyed in their lifetime. ‘The Rubble Club’ has three key ground rules: firstly the architect must be alive and not party to its destruction, secondly the building must have been built with the intention of permanence and thirdly it must have been deliberately destroyed. I think there is an unwritten fourth rule which is that the building must have been architecturally ‘important’ in one way or another so that the loss comes as a shock not just to the architect. It is all a bit tongue in cheek but it points to the issue of (relative) permanence versus temporariness in architecture. Some buildings are intended to be as good as permanent and others are intended to be temporary. 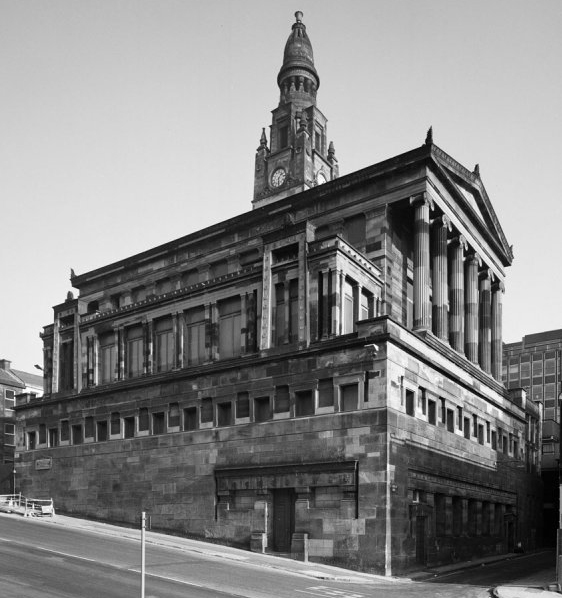 A good example of the permanent variety would be the St Vincent Street United Presbyterian Church in Glasgow (1859) by Alexander ‘Greek’ Thomson – a wonderful ‘set piece’ comprising a temple standing on a massive podium with a tower soaring above. The design was intended to create a link to antiquity and the birth of civilisation and endure into an almost infinite future through the use of a perfect system of proportion, the classical language of architecture and ‘permanent’ materials such as stone and slate. Its monumentality still defines a large part of the centre of the city. Good examples of the temporary variety would be festival architecture or the annually renewed Serpentine Gallery Pavilions in London of which the 2002 version by Toyo Ito is probably the best example. Other buildings are intended to be permanent but end up being temporary (destroyed by fire, flood, earthquake, terrorist attack, redevelopment, decay, lack of funds, inflexibility etc) – a good example would be the twin towers of the World Trade Centre by Minoru Yamasaki which were lost in shocking circumstances. Some buildings are intended to be temporary but end up being permanent. 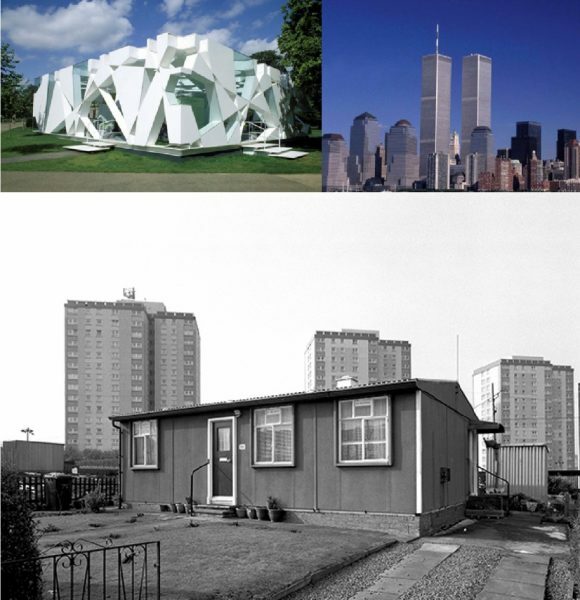 Good examples of these would be the Eiffel Tower, The London Eye and even the post war ‘prefab’ bungalows which were only intended to last a few years but are in some cases still going strong. As a society we are nowadays much more inclined towards the temporary and the throw-away despite moves towards sustainability which suggests adaptive re-use. ‘The Rubble Club’ advocates adaptive re-use as a means of saving threatened treasures. A few years ago I was shocked to see my ‘old’ secondary school (Hermitage Academy in Helensburgh) being reduced to rubble. I was one of the first intakes to a brand new set of buildings. Apparently they had become expensive to maintain and heat and did not lend themselves to modern teaching methods. The value of the site for housing helped fund the new Academy. The answer to my question is probably that apart from a few buildings that acquire an iconic status within society (for example becoming listed buildings), the architect cannot expect that their buildings will not be demolished during their own lifetime. Many clients would be horrified to think that if they commission an architect designed building they could be saddled with it and unable to redevelop their land. Nevertheless the design IDEA remains the property of the architect and one answer may lie in modern technology. Three dimensional computing now allows models of buildings, even ‘lost’ historic buildings, to be created and viewed as they were originally intended. Through three dimensional computing the architectural IDEA can be saved for posterity if not the physical structure which is just its physical embodiment. In theory with sufficient three dimensional records the physical structure could be recreated in a different place at a different time. 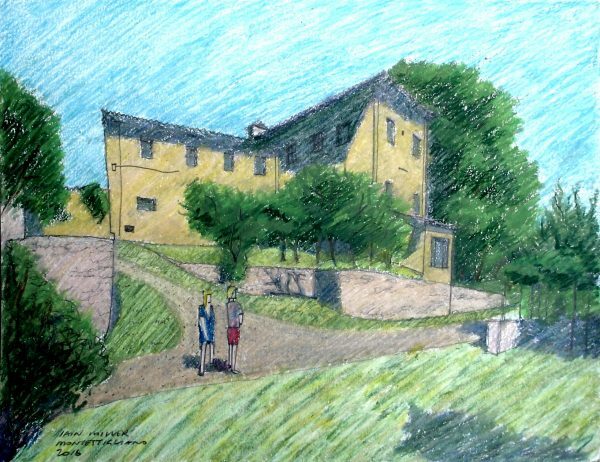 Architects do less freehand drawing than most people probably imagine. The majority of time is spent seeing projects through to completion. 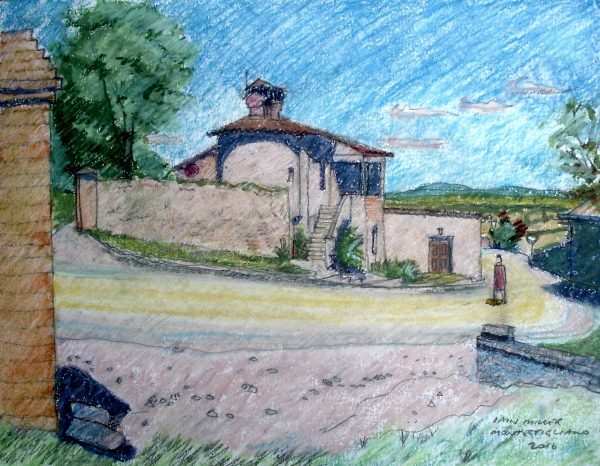 With the advent of computer generated imagery the architectural freehand sketch has become less common but more celebrated as a means of communication in its own right. So it’s always a pleasure to find the time to do freehand sketches when time permits. 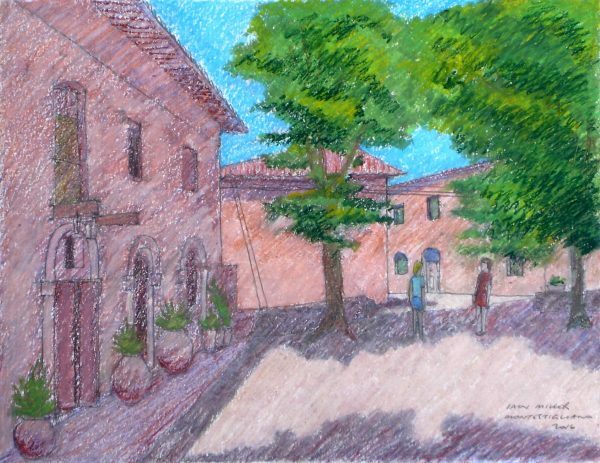 I’ve just returned from holiday in Tuscany where I managed to spend some time sketching. Whilst less accurate than photography, sketching forces one to really look and understand the subject matter and find a way of recording it. I used oil pastels on thick watercolour paper. Oil pastels are great as they are completely dry and easy to get started with. 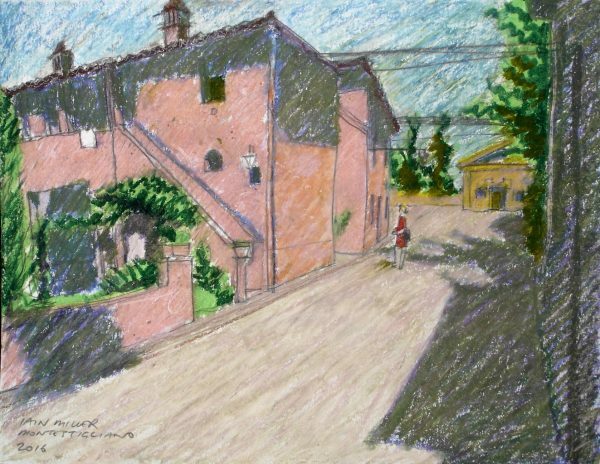 No need for brushes or various solutions – just pastels, a pencil and a sheet of paper. However pastels are fairly blunt so the result will inevitably have that ‘sketchy’ look. The colours can’t be mixed prior to application so they have to be blended on the page which is part of the fun – and the effect. Tuscany in summer is a magical place to sketch. Possible subjects present themselves at almost every turn due to the powerful stone architectural forms, the quality of the light and the dramatic shadows. It’s important to catch the shadows early in the sketch as otherwise they will have moved by the time the sketch is approaching completion. Back to work in late summer in England now – a mixed bag with it’s own particular charms – hopefully an ‘Indian summer’ this year. At the height of the fracking protest in Balcombe in 2013 I went to hear Mark Stevenson http://markstevenson.org , author of ‘An Optimists Tour of the Future’ speak at Forest Row Village Hall. Mark delivered a fascinating overview of future technology and the energy sector. He had a very clear ‘take’ on fracking and the other extreme unconventional means of extraction of gas, oil and coal – such as deep water drilling, tar sands extraction and mountain top removal. It is that these are the desperate and dying acts of an outdated technology that is rapidly being replaced by renewable energy – especially solar energy. Solar energy has the potential to re-order society because it can be home produced thus cutting out the ‘middle man’. 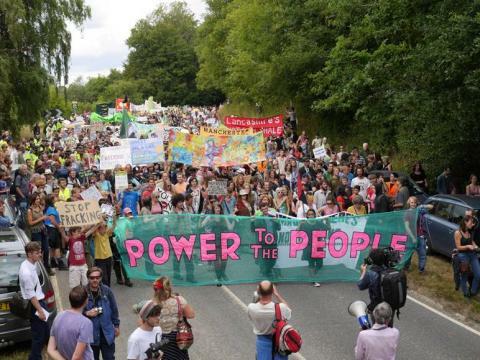 So it was surprising and disappointing to read a few weeks ago of the decision of the planning committee of North Yorkshire County Council to approve plans put forward by an outfit called Third Energy to frack for gas at a site near Kirby Misperton in Ryedale. Yes the frackers are back like the undead from a Hammer Horror movie. The councillors who voted in favour probably thought they were voting for the future when they were in fact voting for the past. Fighting this polluting and dangerous industry, which is designed to make a few people a ‘fast buck’ at the expense of everybody else, before it is stopped is both a local and a national fight and the decision in Yorkshire could have implications here. Leave the hydrocarbons in the ground. It’s where they belong. It was odd to read that after a competition, Heathrow airport has shortlisted four architects to develop designs for it’s expansion http://www.designboom.com/architecture/heathrow-airport-expansion-grimshaw-zaha-hadid-architects-hok-benoy-terminal-6-05-18-2016/. After further work a winner will be selected in July. Odd because the decision to allow Heathrow to expand has yet to be taken by the government. Perhaps they went ahead to apply psychological pressure on the government to choose Heathrow over Gatwick or perhaps it’s a done deal already. But I think it could still be Gatwick if issues of noise, traffic and pollution at Heathrow make the decision so toxic that they trump the so called ‘business case’. The expansion of Gatwick would be a disaster of similar if not greater proportions. It would more than double in size turning East Grinstead and Crawley into another Slough with many flights flying in low over local villages. I’m not convinced by the so called ‘hub’ argument or that the forecast passenger growth will materialise for economic, resource and technical reasons and even if it does there is more than enough capacity beyond Heathrow and Gatwick. Stansted airport, for example, is only at 50% capacity and regional airports could easily cope if only the government directed development in their direction for environmental reasons and the promotion of growth beyond London. It’s not enough just to bow to business and passenger preferences. We can’t squeeze everything into London and a bit of old fashioned government planning is called for. 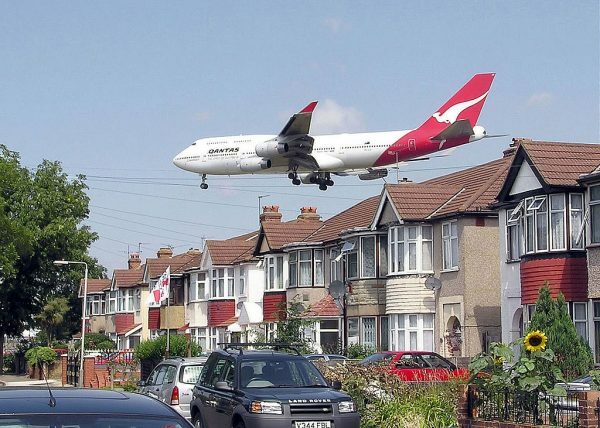 It will be a sad state of affairs if the legitimate concerns about the expansion of Heathrow are addressed by creating a new problem for the communities around Gatwick. Sadiq Khan, the new London Mayor, has lost no time in starting to investigate his predecessor Boris Johnson’s conduct over the procurement of the Thames Garden Bridge http://www.theguardian.com/politics/2016/may/14/sadiq-khan-thames-garden-bridge-boris-johnson-mayor-london. The ‘pipedream’ landscaped pedestrian bridge is intended to link Temple on the north of the Thames with the South Bank. Khan is reportedly unlikely to sign off on a guarantee (that the GLA will act as guarantor of the bridge’s future upkeep in the event that the Garden Bridge Trust is unable to provide the funds) until the procurement process has been investigated further. The suggestion is that the process to select a designer was unfair because Johnson and his team met with the eventual winner of the competition on five occasions and Johnson expressed himself ‘keen’ to see their design selected – all before the competition started. My understanding of the law on this is that if the competition was unfair then the other competitors will have to be reimbursed the costs of preparing their entries. This would be another financial ‘hit’ to the public purse on account of a project which was supposed to be privately funded. Hopefully Sadiq Khan, who has previously described the scheme as ‘another one of Boris Johnson’s white elephant projects’, will go on to make good on his pledge to scrap the project completely. My objection to the Thames Garden Bridge is that it will be an eyesore which will block an important open vista along the Thames. The viewpoints of the clever computer graphics produced to illustrate the design have been selected to hide this fact. The claims that it will ‘transform London’s landscape’ and add ‘greenery’ are spurious. Instead it will destroy an important view of the river. It will be a big incongruous lump that no amount of architectural form making or attention to detail will disguise. Architects and engineers love to build things but sometimes it is better to leave well alone. The unseasonably hot weather took us down to Rye on the Sussex coast at the weekend. Once the haunt of smugglers and highwaymen Rye is within easy reach for a short break. There is a sense of living history amongst the old buildings, cobbled streets and passages and of course there are the other attractions such as sea breezes, fish and chips etc. We’ve visited quite regularly over the years and a visit isn’t complete without calling in to Helen and Andy McConnell’s antique glass shop ‘Glass etc’ on Rope Walk http://decanterman.com/. 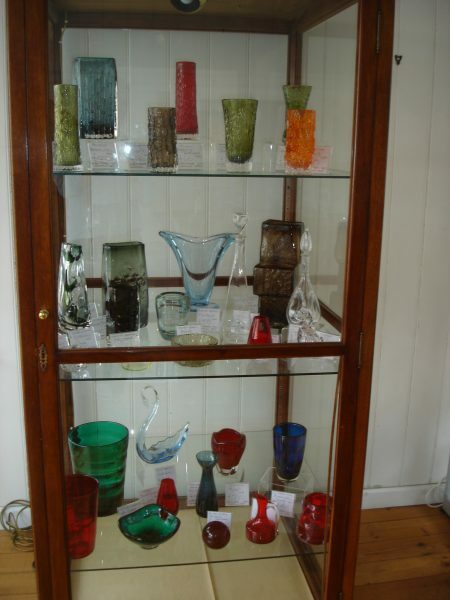 Andy is a renowned expert in glass perhaps most popularly known for his appearances on BBC TV’s Antiques Roadshow. I’ve picked up various ‘Whitefriars’ http://www.whitefriars.com/ glass vases in ‘Glass etc’ over the years in different shapes, colours and sizes. James Powell & Sons (Whitefriars Glass) was a London based glassmaker and stained glass window manufacturer in the 19th and 20th centuries. 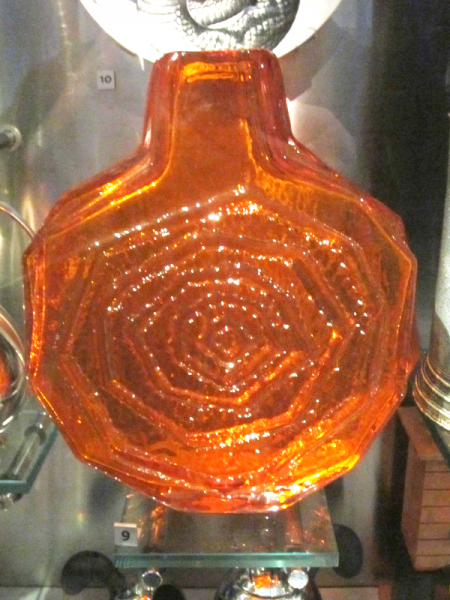 Pieces designed by Geoffrey Baxter, who was employed as a designer between 1954 and the closure of Whitefriars in 1980, are becoming increasingly popular. Coloured, textured and stained glass have always held a fascination for architects on account of the way glass behaves in different lighting conditions. I enjoy cutting fresh flowers and foliage from the garden and arranging them in one of the Whitefriars glass vases on an internal window cill. The variety of expression is endless between the seasonal contents of the vase, the choice of window, the time of day and the month of the year. The glass can be quite special in the right light and the same vase can look very different in say evening Autumn light from how it looks in morning Winter light. The few tens of pounds that the vases have cost have been repaid many times over by the pleasure they give in use. When the government introduced the National Planning Policy Framework (NPPF) as a means to a simplified planning system I bet they weren’t aware of where its simple directives could lead. At the original planning appeal the planning inspector had ruled that consent should be granted, saying that the council had not demonstrated a five-year supply of deliverable housing sites. Paragraph 49 of the NPPF says that ‘relevant policies for the supply of housing should not be considered up-to-date if the local planning authority cannot demonstrate a five-year supply of deliverable housing sites’. Since the council was unable to demonstrate a five-year housing land supply, the inspector decided that the council’s green gap policy could not be considered up to date and should be disapplied in accordance with paragraph 49 of the NPPF but at an appeal to the High Court the judge found that the planning inspector had been wrong to regard the green gap housing policy as one that was out of date. This decision will have national significance, with a direct impact on the decision making process of councils such as Wealden District Council and Mid Sussex District Council which currently do not have a five year supply of deliverable housing sites. 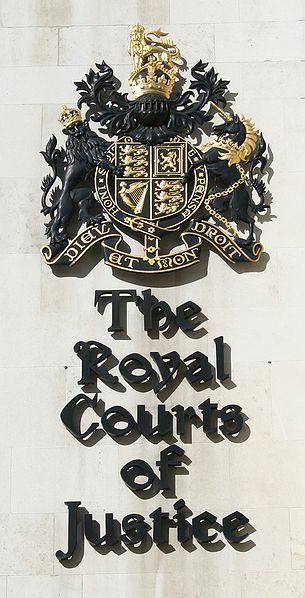 Whilst the Court of Appeal refused permission for Cheshire East Council to appeal to the Supreme Court the council has just made a direct approach to the Supreme Court for the right to appeal. So this game of judicial ‘ping pong’ (council decision / inspector’s decision / High Court decision / Court of Appeal decision) might yet go into a final set at the Supreme Court. The Court of Appeal decision will be of great interest to all those seeking to deliver housing in locations which were previously thought to be constrained by ‘plan policies whose effect is to influence the supply of housing land by restricting the locations where new housing may be developed’. All the usual caveats apply. If this decision is of interest, read the full decision and take professional advice. We’re now into the EU Referendum campaign that culminates in the referendum on 23 June. The opinion polls suggest 55% stay / 45% leave but I think it will be more of a close run thing. Those who intend to vote ‘no’ appear to be clear about why they want to leave but less clear about how things will look if we do whereas those who intend to vote ‘yes’ appear to be less clear about why they want to stay but quite clear about how things will look if we do stay (a version of the status quo). The economic arguments seem to cut both ways – Vote Leave http://www.voteleavetakecontrol.org say we’d save £35 million each week in payments made to the EU that could be spent on the NHS and schools. Britain Stronger in Europe http://www.strongerin.co.uk say that for every £1 we put into the EU we get almost £10 back through increased trade, investment, jobs, growth and low prices. Amongst all the many areas of debate (sovereignty, jobs, trade, investment, security, immigration etc) little is heard of the argument that the European Union has helped avert war in Europe. Perhaps it’s taken for granted that we won’t go to war with our European neighbours but it shouldn’t be if European history prior to the formation of the European Union is anything to go by. When our daughter was in Germany for a two week training course recently we met her in Berlin for the weekend. I’d never visited Berlin before and I was shocked to see the evidence of the destruction wrought during the Second World War. 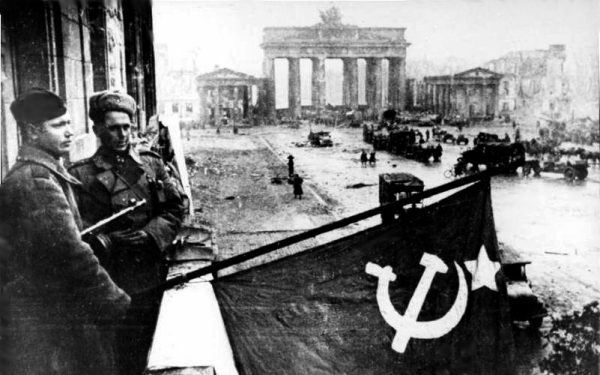 British, American, French and Russian bombers carried out 363 air raids during the course of the war and in the final weeks of the war what remained of the city was flattened by shelling by the Red Army as it made its final assault. The ‘fabric’ of the city has long since been ‘stitched’ together by buildings of varying quality but what is jaw dropping is the amount of post war infill. There is a ghostly sense of what was once there in the form of the layout and scale of the city but it is now just ‘peppered’ with historic landmarks. Thankfully Berlin is nowadays a ‘happening’ place full of young people from all over Europe with business start-ups, restaurants, bars, museums, galleries, clubs and music. They take the EU and the peace that has existing during their lifetimes for granted. Along with the majority of young people in the UK I’ll be voting to remain to maintain the status quo – warts and all. We wanted to catch the exhibition ‘Painting the Modern Garden – Monet to Matisse’ at the Royal Academy before it closes on Wednesday and we managed to get there today. The problem was that many others had the same idea so it was very busy with a crowd of art lovers as colourful as the flowers in the paintings on the walls. 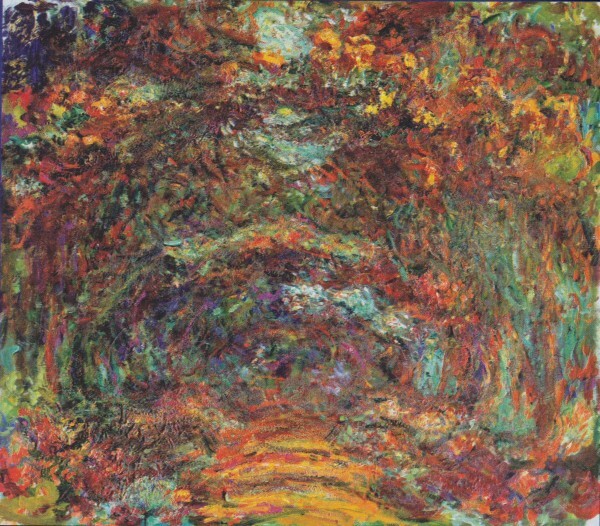 The exhibition includes paintings by a group of artist–gardeners produced during Monet’s lifetime – impressionists, post impressionists and members of the early 20th century avant garde. Lots of gardens full of paths, shadows, foliage, dappled sunshine, broad brimmed hats and parasols. The impressionist movement coincided with the ‘great horticultural movement’ which was driven by access to new varieties of plants from the Far East and the Americas and the emergence of various larger, more showy and more colourful hybrid flowers. The artist–gardeners were depicting a romantic impressionistic ‘earthly paradise’ – a fusion of art and nature that was in contrast to urban and industrial expansion. Of course the paintings don’t depict the ‘natural’ world. They are twice removed with the gardens being a man made assemblage of elements and the paintings a specially selected picturesque view at a particular time of day and season – usually with the sun high in the sky and the flowers in full bloom. The design process for a garden has similarities with that of a building – the need for a strong conceptual idea, a clear circulation system, a sequence of ‘events’, the need for contrast in colour and texture, scale, light and shade etc. For me the best gardens work in tandem with the buildings or garden structures that they contain – walls that continue from the house to the garden to retain soil and enclose and define space, inside–outside space and a variety of spaces that function as external ‘rooms’. Gardens offer a place for the imagination to roam to create something special that can in return offer beauty and inspiration. A still point away from the hustle and bustle of life that is probably even more necessary now than it was 100 years or more ago in the time of Monet.